This week's Tuesdays on the Run theme is Our Favorite Race Distance. Believe it or not, we both actually agree that the 10K is our favorite distance and here's why. *Training for a 10K is not a huge commitment like a half or full marathon. * For some half marathons ( like Disney ones) you need to submit a proof of time from a 10K distance or longer. The one bad thing about having the 10K as our favorite race distance is that 10K's are not very plentiful. Most races are either 5Ks or Half marathons. It can be hard to find a 10K to run. This can be quite frustrating if you are looking for a 10K to get a time to submit for a bigger race ( like Disney). We've helped you out though. Here are several 10Ks that just might be worth running. We say it MIGHT be worth running because we haven't run all of these. Some are still on our list. ( This was another great race to run in the fall, very scenic ( with a few hills). 5. Rock n Roll Series - Some cities only ( Denver, Las Vegas, Montreal, Vancouver, San Antonio, Portland OR, and San Jose), The cities that offer the 10K distance may change for the next race season. If you've ever run a 10K, which one was your favorite? I love 10K's! They are the perfect race length in my mind - long enough to make you feel like you have done a great workout, but short enough that you don't have to train too much. The Cooper River Bridge run is on my list for sure! I have lots of friends who have done it and loved it. Yes, that bridge run looks beautiful! I hate the Bolder Boulder, hate it!! If you think Disney races are crowded, you've never been to the Bolder Boulder. Yes, there are lots of people on the streets to cheer and give weird random food and/or beer, but you can't get a good pace unless you are in the first couple corrals. I went one year and was in MN, yes they went all the way through the alphabet and had to start double letters. I went another year and was even further back. It's a hilly course, and crowded. I purposely avoid it!! Wow, I wonder why runner's World ranked it so highly? Thanks for letting us know! 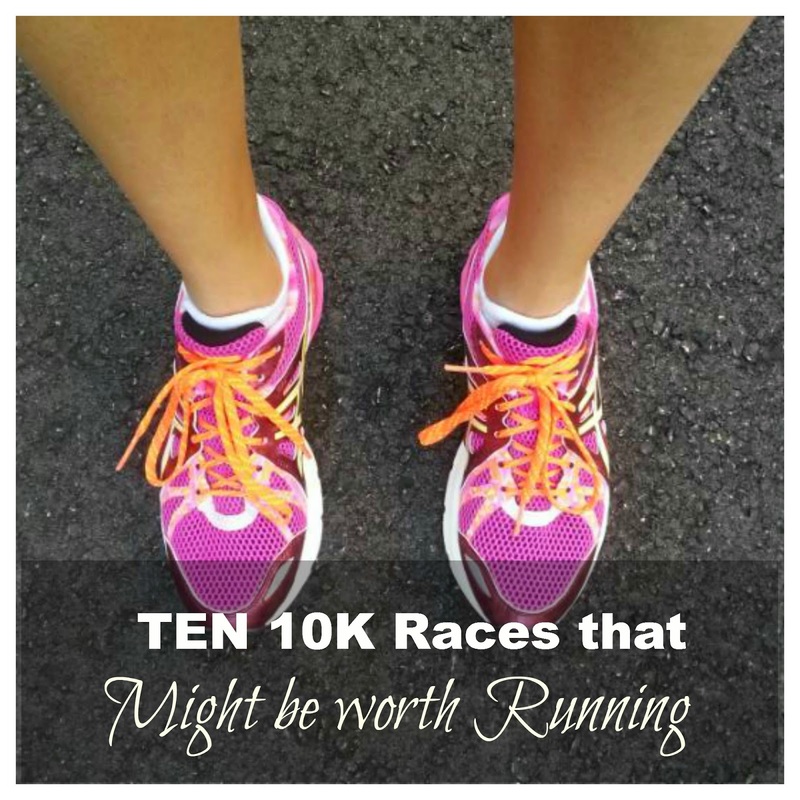 I love 10k's for many of the same reasons. I really have to get to that Hershey race one year. I'm all about chocolate! Yes, that's on our list for sure. They also have a half marathon in October! I like the 10K but seems like not to many are offered around me. So i go with the half instead because 5K are just hard and to short. Yea, 10Ks don't seem to be that plentiful! You have some great 10ks listed. I wish I lived closer. I haven't run that many because there aren't many. My favorite has been the Spring Run Off in Albany, NY (because it's my PR). I've had my best times on some 10Ks too! Ooh... I had no idea about the Hershey one. Sounds fun! The Lawyer's Have Heart 10 k in DC in June was alot of fun. It has a 5k option too. I have heard of that. Probably from your blog...lol. I love 10ks for all of the reasons you mentioned. Although I haven't run that many 10ks, I've actually run two in the past two weeks. My favorite one is the one I ran last weekend on the runway at Dulles Airport. I wish that they were more readily available as 5ks, because I'd love to run more of them! I thought there would be more 10Ks in your area. I guess not. I love the 10k but have only done one official 10k. I like my 6-mile training runs because it's a good distance but it's still not high enough to take up a full day of running and recovery. I've been saying recently how I need to run another 10k! I've done 3, and my favorite was the Sole of the City in Baltimore. I'm hoping to do another once marathon training is over! Yea me too. I'm hoping to do more small-ish races after my marathon! I don't like 10ks. Almost all the ones I've done have been double loops of the a 5k course, and all the "casual"/fun runners have stopped after the first 5k, leaving me DFL in at least one case, and possibly without any course support. One in particular I couldn't seen any runners in front of me, and I had no idea which (residential) street to turn on. I love the 10k! I ran my first official one during the Dumbo Double Dare and just loved the distance! The Cooper River Bridge 10k is so close to me and is definitely on my bucket list! GREAT tips!! I'm trying to talk my sis into the Hershey 10K, and am just waiting on those dates to be released. Thanks Meranda! Oh, that sounds like fun! I hope the 2 of you can make it work. 10k's are my favorite... We are having one around here this weekend & I so wish I were doing it. Are you volunteering at it? There really aren't many 10k races around are there. That is the distance I am training for at the moment. Yea, 10Ks can be hard to find! I've done a handful of 10K's and I don't really care for the distance. I don't feel like I get warmed up until mile 5 or 6 now! But great post! But I agree 10k's are awesome, they are long enough you can get your wind going and yet short enough they don't require the amount of training that half marathon's do, yet you can still feel pretty satisfied about the distance and accomplishment, and the money spent to run them! I just ran my first 10K a couple weeks ago and it's my favorite distance too!! I would add the She.is.beautiful 10K in Santa Barbara and Santa Clara, CA to that list for sure. I LOVED everything about that race! I love 10ks too! The Wicked 10k is one on my "must do" list. I'm running the WDW 10k and it will be interesting to see how I feel about "just" doing the 10k that weekend! Thanks for linking up with us today! I like 10Ks for the reasons you listed! Having run one this past Sunday, I wrote I need to run more of them in 2015 :) This list will come in handy! I am training for a 10k right now. I have never run one! Very excited. There were a few to pick from in Harrisburg during the time frame I was looking for. I wish I could run the Boulder 10k. Man, I loved Boulder! Peachtreee Road Race in Atlanta on July 4th should go on your list! The largest 10k in the world! Peachtree Road Race in ATL...world's LARGEST 10k! Its a fun time, cheerleaders the WHOLE 6.2 miles. Sure its hot cuz its July 4th but its an Atlanta tradition get up and run down Peachtree. Give it a try, its so much fun. Great list! I love the NYRR Mini 10K, an all-women race that starts on Central Park West, then loops Central Park. The atmosphere is awesome. That said, it is not my favorite distance - I would take a 5K or a half marathon over a 10K any day! I never seem to nail pacing for 6.2 miles. I'd like to do that Cooper River 10k or the Bolder Boulder. Personally, we have a few local 10ks that I just love! It's fun to push my limits in the comfort of my hometown! I did the Bolder Boulder 2 years ago for the first time and I LOVED it...I had purposefully avoided it because of the crowds, but I had a free entry that year, so I took the shuttle in...I ran in a qualified wave ( EA). The shuttle cost $8 dollars and was worth every penny, it dropped me off right at the start line. It was chilly that morning and there were people giving out free coffee ( yes please!) the waves are purposefully small so it isn't too crowded on the course. The course is fun...you go through neighborhoods in Boulder around campus and end doing a lap around the track in the CU stadium...it was super well organized. The course has a hill in the middle...and it's in Colorado, so out of towners may have an issue with the altitude...you can run this course as a fun run...ie eat the bacon, drink the beer, do the slip and slides, etc...but I just ran it. The expo after the race is fun, there are lots of giveaways including free shoes from saucony and if you hang around, you can go back into the stadium and watch the elites finish...it is pretty amazing to see those runners tearing around the track doing 5 minute miles. They also have flyovers and parachuters at the end of the race...I'd definitely do it again, but only in a qualifying wave...I have heard that the open waves are more congested.